We invite you to read the May issue of our INSIDE ATLAS.ti: The QDA Newsletter. In this issue, we present the profile of Luis Alfredo Loaiza, an officially certified professional trainer from Colombia, who is actively providing consultation and training services in that country and Argentina. Luis Alfredo is one of the many of professionals who have successfully applied for our trainer certification program and thus joined our international network of independent consultants. We also include in this issue of INSIDE ATLAS.ti a short article describing the research project Qualitative Examination of Clinical Pastoral Education (CPE) in Disaster Relief Settings. This project represents a case study of the application of ATLAS.ti in research conducted by non-for-profit organizations. Along the same lines, we profile the project Indigenous Midwives and their Skills in Contributing to the Wellbeing of Birthing Women and Newborns (Jeeva Project). Finally, in this issue of INSIDE ATLAS.ti we highlight the resources we make available to the community of user to learn ATLAS.ti effectively, and publish a brief note on mixed methods work with ATLAS.ti. Enjoy! ATLAS.ti 8 for Windows is coming later this year. All licenses and upgrades purchased after April 1, 2015 qualify for a FREE UPGRADE once version 8 is released. So there is no need to wait–start your analysis today, and switch ATLAS.ti 8 for free later. A preview of new features to come soon. Note: Support for the older Version 6 ends with the release of ATLAS.ti 8. Upgrade to ATLAS.ti 7 now and get v.8 free of charge later this year! ATLAS.ti supports bottom-up as well as top-down or mixed approaches to coding. You can work very granularly at the quotation level, generating meaning by taking a very close look at your data even before attaching a first code. You can move up the levels of aggregation until you take a birds-eye view to look at your data from a different and if you wish quantitative perspective. ATLAS.ti offers the full range of tools that covers the entire spectrum. Having said this, you can of course approach analysis directly from a mixed-method perspective, apply thematic codes or a deductive framework that is guiding your research project. How does this work? If you already have a code list, you prepare it for import into ATLAS.ti. You add your data to the project and group it according to the variables you want to consider in your analysis. When importing survey data, variables are added to the Excel spread sheet that you import. Next, you code the data; depending on the type of data you have, the automatic coding feature can help you to speed up the process. Your data is now ready for further analysis. The tools at your fingertips in ATLAS.ti are the codes-primary-documents table that provides a cross-tabulation of codes by documents or codes by variables; the code-cooccurence table if you are interested in cross-tabulating codes – this can also be combined with an analysis by variables. Further analysis options are provided by the query tool if you want to compare and contrast groups. All of these options can be found under the Analysis menu. Above you find a illustration of the process. If we have made you curious, in the next issue of INSIDE ATLAS.ti. you will find a step-by-step guide on how this works. ATLAS.ti has programs to certifiy student and professional trainers/consultants on ATLAS.ti. The Certified ATLAS.ti Student Trainer program (CAST) provides certification to those students who can demostrate enough knowledge and experience using the software in their theses and dissertation studies, so that they can introduce their peers to the basics of ATLAS.ti. Our Certified Professional Trainer program (CAPT) provides certification to those seasoned academics and researchers who are using ATLAS.ti in their research projects and can demonstrate expertise in the use of the software. All certified instructors become part of a network of ATLAS.ti trainers and consultants and qualify for special support from us. To apply for these programs, please click here . In this issue of INSIDE ATLAS.ti, we will profile Luis Alfredo Loaiza, a Colombian sociologist who has been certified as a professional trainer. Luis Alfredo is a Colombian sociologist sharing residence between Cali, Colombia, and Buenos Aires, Argentina. Since early in his career, Luis Alfredo has incorporated computer-assisted qualitative data analysis software (CAQDAS) and other technologies into his academic and research work as an applied sociologist working in program systematization and evaluation. As a methodology consultant and while exploring cyber-sociology, in 2005 Luis Alfredo tried ATLAS.ti for the first time. Since then, he has incorporated the software into the analysis of his own research data and has taught the program in several Colombian universities and to people from different academic backgrounds. In 2014 Luis Alfredo published an article on the ATLAS.ti Research Blog and soon after he obtained certification as professional trainer of ATLAS.ti. As a certified professional trainer, Luis Alfredo receives support from ATLAS.ti Scientific Software Development GmbH in terms of training and promotion of his consulting services. His contact information is now listed on the ATLAS.ti website, available to whoever needs help incorporating the software into their research projects. Luis Alfredo finds himself busy these days, preparing a roadshow to introduce ATLAS.ti at a number of universities in Argentina and Colombia and accepting invitations to teach intensive workshops in these two countries. He is also getting ready to launch his website, which will help to further expand his reach throughout Latin America. We are happy to have Luis Alfredo in our network of consultants. This promises to be a mutually beneficial relationship. All those who are committed to learn ATLAS.ti are able to access a number of resources that can help them as they engage in the learning process. You may start by attending one of our introductory webinars, taught in the English and Spanish languages. The full calendar can be found here. If you cannot attend our webinars, you may watch a recording of the introductory presentation available on our video tutorial library, where you can also find a set of videos explaining key functions and procedures with the software. Although these videos will show you the technicalities of ATLAS.ti, it is important that you also consult the manuals for a comprehensive and integrated view of the software. ATLAS.ti manuals are available as quick tour documents and as full reference guides here. Additionally, our in-house team of instructors offer introductory and advanced workshops, in the English and Spanish languages. To attend the introductory workshops, the only requirement is to know the basics of the Windows or Mac environments (depending of the version of the ATLAS.ti software) and to be motivated to learn. The advanced workshops require that participants have an intermediate level of expertise on the software and are already using the program in their research projects. The calendar of these courses can be found on our website here. Alternatively, workshops and consulting services are offered by our highly qualified network of independent consultants. Courses are being offered in the upcoming months in the UK, Netherlands, Mexico and Costa Rica. Visit our website for more information. If you would like a course at your own facilities, anywhere in the world, please write to us at [email protected]. The book Qualitative Data Analysis with ATLAS.ti, written by Susanne Friese, constitutes another important resource for users. In this book, which is now in its SECOND edition, the author explains ATLAS.ti and shares with readers methodological advice on how to approach the analysis of the data with the software. This book, and its companion website, offers invaluable guidance to all of those who desire to use ATLAS.ti at its maximum potential. Other bibliographic resources may be found in this partial annotated bibliography which focuses on the use of ATLAS.ti in health sciences. Finally, take a look once in a while at our research blog, where you will find applications and best practices with ATLAS.ti. For a complete list of our continuously expanding learning resources, visit our website at atlasti.com. You may also write to us at [email protected] or call us at +1-541-286-4391 (United States Pacific Time). We are here to help! Madrid, Spain: June 15th, 2015. Online introductory classes in English and Spanish. Check schedule and register here. Free introductory webinars. Once a week. Check schedule and register here. Free webinars on special topics with ATLAS.ti. Check schedule and register here. Free group introductory webinars. If your organization is evaluating ATLAS.ti or you want to introduce it to your students, schedule a presentation with one of our instructors. Complete this registration form. Courses by independent consultants: UK, Netherlands, Mexico. Check dates here. Eleventh International Congress of Qualitative Inquiry (ICQI). University of Illinois at Urbana-Champaign, United States. May 20th-23rd. Fourth Annual IPSA-NUS Summer School for Social Science Research Methods. National University of Singapore. June 8th-19th. The Center for Pastoral Education at the Jewish Theological Seminary , an organization located in New York City, United States, has adopted ATLAS.ti for the data analysis of their research projects. One of the projects in which ATLAS.ti is utilized is the Qualitative Examination of Clinical Pastoral Education (CPE) in Disaster Relief Settings . This study is an evaluation of a novel Clinical Pastoral Education training unit—the disaster relief CPE. The training unit enables chaplain interns to work directly with people who are still recovering from the effects of Hurricane Sandy in hard hit areas of New York City. Hurricane Sandy hit the eastern coast of the United States, after having caused damaged and devastation in the Caribbean, between October 27 th and 29 th 2012. 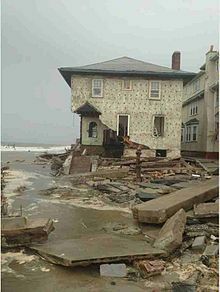 Communities in the states of New Jersey and New York were hit the hardest. In the United States alone, damages to the physical infrastructure and property were valued in USD$65 million (see article on Hurricane Sandy on Wikipedia . The pictures below show some of the scenes of areas hit in New Jersey and New York. 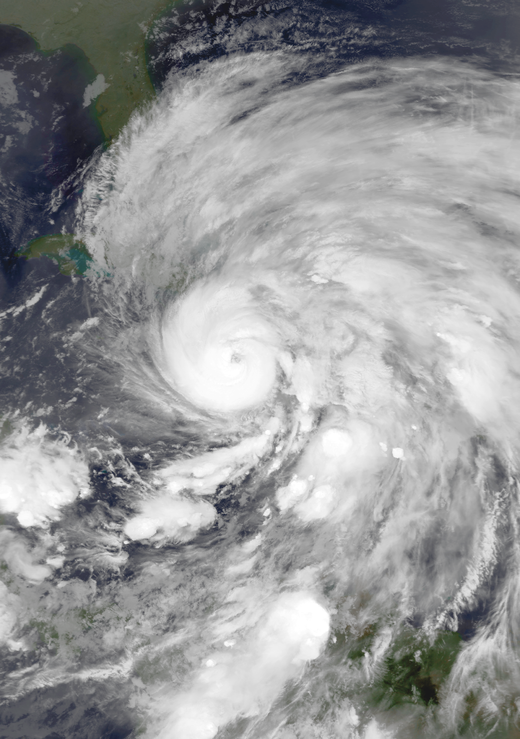 Satellite image of Hurricane Sandy. Source: Wikipedia. Damage to a house in Brooklyn, New York City. Source: Wikipedia. Disasters, by their very nature—unpredictable, uncontrollable, and potentially devastating to individuals, families and communities—represent the kinds of events that CPE students may encounter in their future ministry. Spiritual care provides a crucial part of disaster relief efforts. The CPE program enables chaplain interns to work directly with people who are still recovering from the hurricane. Clinical Pastoral Education students attend to clients’ spiritual needs as part of a multi-disciplinary team located in three different social service agencies. These social service agencies serve diverse clientele (i.e. elderly, families, immigrants—e.g., individuals who speak Spanish or Russian as their primary or only language). The goal of the Qualitative Examination of Clinical Pastoral Education (CPE) in Disaster Relief Settings study is to provide an in-depth description and examination of the action-reflection learning processes of CPE students who are immersed in specialized disaster-relief settings, with a particular focus on the case of Hurricane Sandy. This goal will be accomplished through in-depth, rigorous qualitative analysis of both written pastoral reports as well as audio-recorded, transcribed verbatim seminars. The analysis is conducted by a team comprised of Center for Pastoral Education faculty and staff, a research assistant, and interested CPE students. All CPE verbatim sessions (30 sessions, each session lasting 45 minutes) are digitally audio-recorded (with consent from the CPE students) and professionally transcribed by an experienced service familiar with maintenance of confidentiality. The Project Director and research assistant reviewed all transcripts and developed a coding scheme (i.e., “codebook”) using qualitative methods (iterative development and consensus meetings). 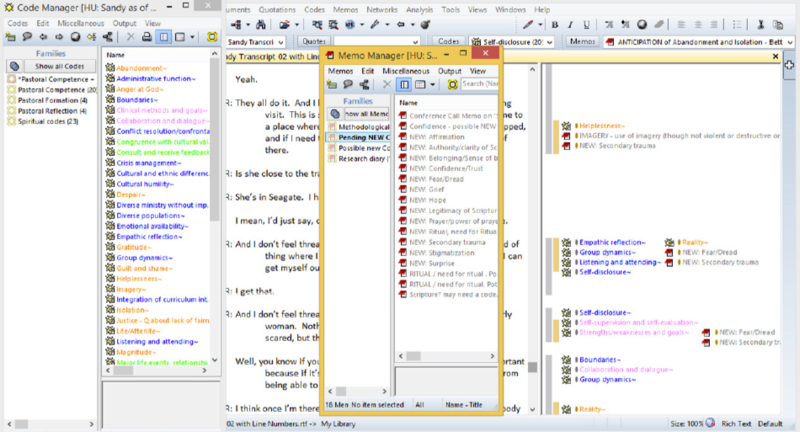 The analysis project with ATLAS.ti includes about 40 primary documents, with approximately 200,000 words of written transcriptions of the CPE verbatim sessions. Team members (located in the states of New York, Michigan and California) code independently from each other towards the two research objectives. Having agreed on a set of a priori codes from existing disaster chaplaincy literature and from clinical pastoral education in healthcare settings, these gave us two sets of codes. When new interpretations of existing codes or new codes seem to emerge from the data, we create memos and have conference calls to discuss what we incorporate as a new code or a new interpretation. When confirmed some of these memos are easy to change into codes. ATLAS.ti project files are shared through Dropbox and team members regularly back-up the project using the Copy Bundle function. See below two screenshots showing different aspects of the ATLAS.ti project. The Code Manager, the Memo Manager and the document margin. 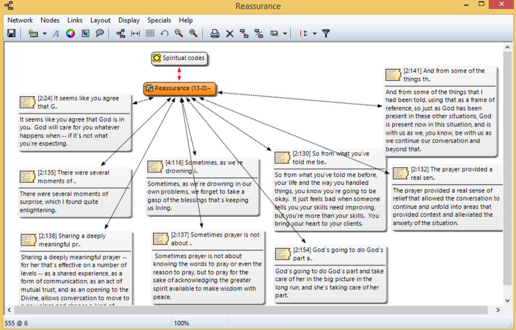 The network view of a code showing a selection of strong quotations. Chaplain Kestenbaum, who has recently moved to New York to serve as CPE Supervisor at JTS, plans to continue her activities as a chaplain-researcher, and would like to turn her attention at this time to assessment and examination of CPE training and encouraging research literacy among CPE students. This project therefore represents an important stepping-stone for CPE-focused research. The poster proposal to present preliminary findings of this research was accepted by the Association of Professional Chaplains (ACP) and will be presented at the Association’s annual conference, which will take place this year in Louisville, Kentucky, in June 2015. To learn more about this project, please contact Allison Kestenbaum, project director, by writing to her to alkestbaum at jtsa dot com. A Note on the "JEEVA PROJECT"
In this brief article, we are profiling a research project in India that utilizes ATLAS.ti in data analysis. The Indigenous Midwives and their Skills in Contributing to the Wellbeing of Birthing Women and Newborns (The “Jeeva” Project) is a research initiative concerned with strengthening Dais and the indigenous midwifery system in India and enabling their linkage with the formal health services. The project is administered by the Centre for Women's Develop­ment Studies (CWDS) , New Delhi. The study is guided by a team of six “Jeeva Shepherds”, coming form the fields of public health and social sciences, biomedicine, Ayurveda , nurse-midwifery, natural childbirth teaching, reproductive health management and ethnography. The principal investigator is Mira Sadgopal and the project coordinator is Sandhya Gautam. The Pilot Study (January-June 2009) laid the foundation through serial in-depth interviews of 13 experienced Dais in a field area in Bokaro district of Jharkhand, costs being covered by two small personal grants. The Pilot Study Report ‘Entering Dais’ World’ came out in 2010 and is available to download from the website. In the Bridge Period (July 2009 - September 2010) we prepared for the main study in 4 study sites in Jharkhand, Karnataka, Maharashtra and Himachal Pradesh, carrying out four exploratory exercises. The costs were covered mainly by the ICICI Centre for Child Health & Nutrition (ICCHN) of Pune with critical solidarity support from the Centre for Health & Social Justice (CHSJ), Sama Women & Health Resource Centre and the Dr. Nanda of the Population Foundation of India (PFI), all in New Delhi. The multi-centric Jeeva Study (Oct 2011 – Apr 2015) extended the research in four remote regional sites covering a total study population of around 40,000 (about 10,000 in each site). With qualitative as well as quantitative dimensions, the study looks at the Dais contextually to learn about their traditional practices in normal and complicated births and to investigate the utilisation of Dais’ care especially by the poorest. It also studies other informal and formal (i.e., governmental) providers of childbirth care and how they make use of Dais. With an enumerated study population, surveying households and providers, tracking both retrospective and prospective births, directly observing births when possible and doing multiple interviews with about 120 Dais, the study looks at the prevalence and outcomes of key traditional practices and also compares women’s experience of childbirth at home and in institutional (hospital) settings. Moreover in studying the issues within contrasting knowledge frameworks the study works towards building a bridge between the Dais’ indigenous community-based worldview and the Public Health outlook molded by modern biotechnology and management. Generating a sound and varied evidence base will enable us to propose to Government how Dais can strengthen the health services to enhance the survival and wellbeing of mothers and newborns. The fieldwork of 2½ years ended on 31st March 2014 and data analysis is currently in progress. The findings will help in integrating Dais’ contribution into the National Health Mission (NHM). We envision safer childbirth through strengthened community-based birth attendance with appropriate changes in the formal health care system. We are committed to seeing the Dais’ potential realised systemically before their insight, knowledge and skills are lost.